Sitting leisurely in the morning with a slice of Coffee Cake and a steaming cup of coffee, is one of life's little pleasures. This is your classic 'crumb' Coffee Cake recipe. It has a rich and buttery flavor and soft moist texture. But what makes this Coffee Cake so unique is the grainy crumb mixture that sits on top of the cake plus runs through its center. You can serve this cake while it's still warm from the oven, at room temperature, or even cold. Leftovers can be covered and stored for a few days at room temperature. Coffee Cakes are the informal cakes, the ones for everyday. Although called a "Coffee" Cake, it does not usually contain coffee. The name more often refers to how the cake is eaten, that is, with a cup of coffee. While some coffee cakes contain yeast, this Coffee Cake is like a butter cake, that is, leavened with baking powder and baking soda. Its rich flavor and texture comes from adding sour cream (full or reduced fat) to the batter. (You can replace the sour cream with plain yogurt for a lighter cake.) Coffee cakes are instantly recognizable by their delicious crumb topping, and for this recipe we use chopped nuts (pecans, walnuts, almonds, or hazelnuts), light brown sugar, mini chocolate chips, ground cinnamon, and a little flour. I love how the crumb mixture turns slightly crunchy when baked, and its grainy texture contrasts nicely with the soft and moist butter cake. Preheat oven to 350 degrees F (180 degrees C) and place rack in center of oven. Butter (or spray with a non stick vegetable spray) a 9-inch (23 cm) spring form pan. Line the bottom of the pan with a circle of parchment paper. Crumb Topping: Place the nuts on a baking sheet and bake for 8 - 10 minutes or until fragrant and lightly browned. Let cool and then coarsely chop. Then, in a small bowl, stir together the chopped nuts, sugar, chocolate chips, ground cinnamon and flour. Set aside. 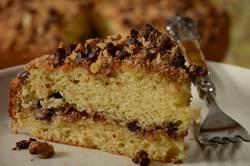 Coffee Cake: In a separate bowl whisk together the flour, baking powder, baking soda, and salt. In the bowl of your electric mixer (or with a hand mixer), beat the butter until softened (about 1 minute). Gradually add the sugar and continue to beat until light and fluffy (about 3-4 minutes). Add the eggs, one at a time, beating well after each addition. Scrape down the sides of the bowl as needed. Beat in the vanilla extract. With the mixer on low, add the flour mixture (in three additions) and sour cream (in two additions) alternately, starting and ending with the flour. Mix only until combined. Spoon half of the batter into the prepared pan, smoothing the top with an offset spatula or back of a spoon. Sprinkle about half of the crumb topping on top of the batter. Cover with the remaining batter and then sprinkle with the remaining crumb topping. Bake for about 40 - 50 minutes, or until a toothpick inserted into the middle of the cake comes out clean. Remove from the oven and let rest for about 10 minutes before releasing the sides of the pan.